Why Be Curious? Dolcetto is known for having some pudgy short, rustic tannins – we love those picnic wines. Scarpa, as you’ve probably figured out already, isn’t like those. The tannic structure is elegant, with lots of classic Dolcetto black tea and ink in the nose. Does Dolcetto age? If it’s grown in the right soil, and picked and vinified with care, we confirm without reservation. Scarpa recently released a good bit of the 1999. It’s stunning. Vigna / Vineyard: Poderi Bricchi is Scarpa’s 50-hectare estate vineyard area in Castel Rocchero, in the heart of the Monferrato. 27 of the 50 hectares are planted with nine grape varieties that produce 11 wines. 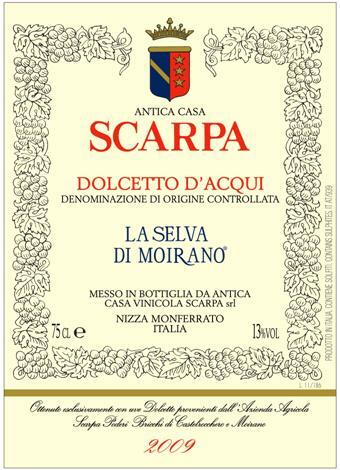 (Scarpa also sells off some grapes.) The remaining 23 hectares are forests and fields, which Scarpa deliberately leaves unplanted in order to maintain biodiversity and healthy vineyards. Vineyard treatments are copper and sulfur. Cantina / Cellar: Fermentation and aging for at least a year in stainless steel tanks, followed by a minimum of one year (and usually much longer) in bottle before release. Some vintages see some time in large casks before bottling. Nome / Name: La Selva di Moirano. Ettari / Hectares: 1.5 Ha. Quota / Altitude: 450 m / 1480 ft.
Suoli / Type of soils: Mostly clay. Vitigni / Varieties: 100% Dolcetto d’Acqui. Data di vendemmia / Harvest date: September 25th. Resa / Yield: 5500 kilograms / hectare. Fermentazione alcolica / Alcoholic fermentation: 12 days in stainless steel. Élevage: In stainless steel, plus 6-12 months in bottle before release. Produzione annua / Annual production: 1500 cases (6x750ml). Gradazione alcolica / Alcoholic %: 13%. Tappo e bottiglia / Closure and bottle: Natural cork, 750 ml Bordeaux bottle embossed with the Scarpa logo.